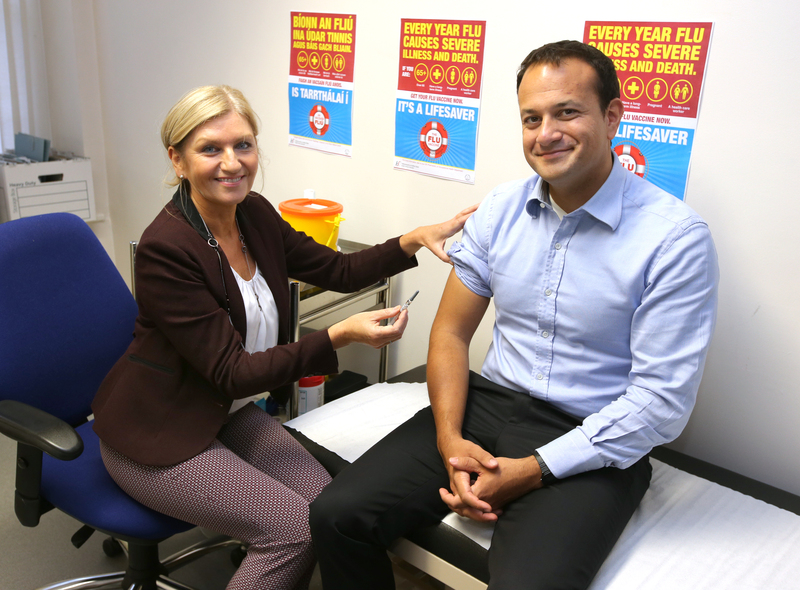 Minister for Health Leo Varadkar today joined the HSE, Thursday 9th October, to urge people in at-risk groups to get vaccinated against influenza and warned that flu causes severe illness and death in Ireland every year. The flu vaccine is a lifesaver because flu can be a very serious and sometimes deadly disease, with potentially 1,000 flu related deaths in Ireland during a severe flu season. * That is why those who are most vulnerable to the complications of flu need to get vaccinated. The Head of the HSE’s National Immunisation Office, Dr Brenda Corcoran said: “The flu vaccine is the best defence against flu, yet every year many people in the at risk groups fail to get vaccinated and so put themselves at risk of serious illness or even death. “The vaccine reduces infection and associated illnesses and hospitalisation. Flu is very infectious and can cause potentially serious illnesses especially for older people, those who have a chronic illness, those with weakened immune systems and pregnant women. Seasonal flu vaccine can be given at any stage of pregnancy and also protects the baby. The flu vaccine cannot give you the flu as it does not contain any live flu virus and all those at risk should get vaccinated as soon as possible this year to make sure that they are protected. “The symptoms of flu usually develop over a matter of a few hours and include a high temperature, sore muscles, dry cough, headache and sore throat. Flu is different from the common cold, which tends to come on more gradually and usually includes a runny nose and a normal temperature. “Flu is spread by coughing and sneezing so people should cover their nose and mouth with a tissue, disposing of the tissue as soon as possible and washing their hands with soap and water as soon as possible to help prevent the spread of flu. “Anyone who gets flu should stay at home, rest, drink plenty of fluids and use over-the-counter flu remedies to ease symptoms. People in high-risk categories should contact their GP if they develop flu symptoms.” said Dr Corcoran. Indications so far suggest that national uptake figures show that 59.2% of people aged 65 and over who hold a medical card or GP visit card received the flu vaccine during the 2013-2014 flu season. This uptake rate is higher than in the two previous seasons when the rate was just under 57%. However it is less than the World Health Organization target of 75%. It is important for all those in the at risk groups to be vaccinated again this year as the virus strains in the vaccine have changed since last year. This year’s seasonal flu vaccine protects against the three common flu virus strains expected to be circulating this year based on advice from the World Health Organization. Seasonal flu vaccines are safe and have been given for more than 60 years to millions of people across the world. Reactions are generally mild and serious side effects are very rare. Healthcare workers, including doctors, nurses, therapists and carers also need to get the seasonal flu vaccine every year. It is important that all those working in frontline healthcare protect themselves from getting the flu but also to prevent spreading the flu to vulnerable patients. Older and at risk patients may not get sufficient protection from the vaccine themselves so people who care for them need to be vaccinated. 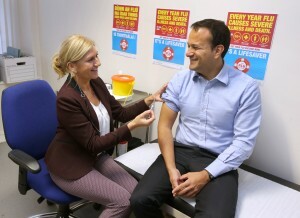 The flu vaccine is available free to healthcare workers from their local Occupational Health department. In addition to seasonal flu vaccination, some people in the at-risk groups may also need pneumococcal vaccine which is available from GPs. Pneumococcal vaccine is not required every year – most people only need to get it once, so those at risk should check with their General Practitioner. The vaccine and consultation are free for those with a Medical Card or GP Visit Card. Those without a Medical Card or GP Visit Card will be charged a consultation fee. Those aged 18 years or older in the at risk groups may attend either their GP or pharmacist for vaccination and those under 18 years should attend their GP. The HSE’s dedicated immunisation website – www.immunisation.ie – provides details on the annual flu vaccination and the pneumococcal vaccine, along with answers to any questions people may have about flu. Information leaflets are available to download. Information leaflets are also available in GP surgeries, pharmacists and HSE Local Health Offices.